Occasionally, very occasionally, a book comes along that refocuses us as booksellers and gives us the feeling that we can serve our community by being brave enough to support something desperately worthwhile. A book of this ilk was The Super Afrikaners published 40 years ago by a courageous young publisher whose name was Jonathan Ball. A book with the same potential to make an impact is available on our shelves in select stores now, and will be available nationwide from next week. We are proud to sell it, proud to stand by its disclosures and convinced that it will have a significant impact on our national discourse. It presents an alarming picture of how a national institution has failed the country it serves and it shines an unnerving light on Intelligence structures that are used to serve individual or factional interests. Every South African who is concerned about issues of leadership, good governance and the equitable treatment of those who serve the State needs to read this book. Being informed offers a chance for redress; being ignorant will impoverish us all. The story of a ‘rogue unit’ operating within the South African Revenue Service (SARS) became entrenched in the public mind following a succession of sensational reports published by the Sunday Times in 2014. The unit, the reports claimed, had carried out a series of illegal spook operations: they had spied on President Jacob Zuma, run a brothel, illegally bought spy ware and entered into unlawful tax settlements. 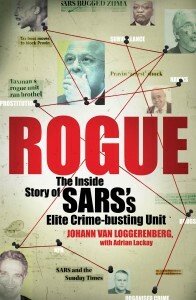 In a plot of Machiavellian proportions, head of the elite crime-busting unit Johann van Loggerenberg and many of SARS’s top management were forced to resign. Van Loggerenberg’s select team of investigators, with their impeccable track record of busting high-level financial fraudsters and nailing tax criminals, lost not only their careers but also their reputations. Now, in this extraordinary account, they finally get to put the record straight and the rumours to rest: there was no ‘rogue unit’. The public had been deceived, seemingly by powers conspiring to capture SARS for their own ends. JOHANN VAN LOGGERENBERG was a group executive at SARS before he resigned from the tax authority in early 2015 after 16 years’ service. His name featured publicly for his involvement in SARS investigations into individuals such as Billy Rautenbach, Irvin Khoza, Julius Malema, Lolly Jackson, Glenn Agliotti and Radovan Krejcir. He currently consults for law firms and private forensic investigation companies. ADRIAN LACKAY is a former spokesperson for SARS. Before he started at the tax authority in 2003, he worked as a journalist and political correspondent.